William "Smokey" Robinson, Jr. (born February 19, 1940) is an American R&B and soul singer and songwriter. Robinson is noted for being one of the primary figures associated with the Motown record label, second only to the company's founder, Berry Gordy. As both a member of Motown group The Miracles and a solo artist, Robinson recorded seventy Top 40 hits for Motown between 1959 and 1990, and also served as the company's Vice President from 1961 to 1988. Robinson was born and raised in Detroit, Michigan, and was nicknamed "Smokey" as a child, because of his love of westerns. The name originally came when an uncle (who would take a young Robinson to see westerns) gave him the name "Smokey Joe", Robinson began being called "Smokey" whilst in his teens. In 1955, Robinson founded a group he called "The Five Chimes" with his best friend Ronnie White, and Northern High School classmates Pete Moore, Clarence Dawson, and James Grice. By 1957, the group was called "The Matadors" and included cousins Bobby Rogers and Claudette Rogers in place of Dawson and Grice. With Robinson as lead singer, the Matadors began touring the local Detroit venues. In 1958, Robinson met songwriter Berry Gordy, Jr., who co-wrote for them the single "Got a Job," an answer song to The Silhouettes' hit single "Get A Job." The group renamed itself The Miracles, and issued singles on both End Records and Chess Records before Robinson suggested to Berry Gordy that he start a label of his own. In 1959, Gordy founded Tamla Records, which he soon reincorporated as Motown. The Miracles were among the label's first signees. Gordy and Robinson had a synergistic relationship, with Robinson providing a foundation for Motown's hit-making success and Gordy acting as a mentor for the budding singer and songwriter. By 1961, Gordy had appointed Robinson vice-president of Motown Records, a title Robinson held for as long as Gordy remained with the company. The 1960 single "Shop Around" was Motown's first #1 hit on the R&B singles chart, and the first big hit for The Miracles. They scored many more hits over the years, including "You've Really Got a Hold on Me" (1962), "Mickey's Monkey" (1963), "Ooo Baby Baby (1965), "The Tracks of My Tears" (1965), "Going to a Go-Go" (1965), "More Love" (1967), and "I Second That Emotion" (1967). Besides penning hits for his own group, Robinson also wrote and produced hits and album tracks for other Motown artists. Mary Wells had a big hit with the Robinson-penned "My Guy" (1964), and Robinson served as The Temptations primary songwriter and producer from 1963 to 1966, penning hits such as "The Way You Do the Things You Do," "My Girl," "Since I Lost My Baby," and "Get Ready." Among Robinson's numerous other Motown compositions are "Still Water (Love)" by The Four Tops, "Don't Mess With Bill" by The Marvelettes, "When I'm Gone" by Brenda Holloway, "Ain't That Peculiar" and "I'll Be Doggone" by Marvin Gaye, "My Guy" by Mary Wells and "First I Look at the Purse" by The Contours. Fellow singer/songwriter Bob Dylan described Robinson as "America's greatest living poet." Robinson's hit ballads also earned him the title "America's poet laureate of love." Over the course of his almost 50-year career in music, Robinson has over 4,000 songs to his credit. After marrying Claudette Rogers, Robinson started a family, and named both of his children after Motown: his son was named Berry after the company's founder, and his daughter was named Tamla after the Motown imprint for which Robinson and The Miracles recorded. The Miracles remained a premier Motown act through most of the 1960s. Albums were released as "Smokey Robinson & the Miracles" after 1965. By 1969, the group's fortunes began to falter, and Robinson decided to quit The Miracles so that he could remain at home with his family and concentrate on his duties as vice president. The group stopped recording and Robinson prepared to leave the group. Unexpectedly, however, their 1966 recording of "The Tears of a Clown" was released as a single in 1970, and became a #1 hit in both the United States and the United Kingdom. Due to the surprise success of "Tears of a Clown," Robinson was convinced to remain with The Miracles for a few more years. In 1972, he followed through on his original plans to leave the group, and The Miracles began a six-month farewell tour. On July 16, 1972, Smokey and Claudette Robinson gave their final performances as Miracles at the Carter Barron Amphitheater in Washington, DC, and Robinson introduced the group's new lead singer, Billy Griffin. The Miracles went on for a while, even having another #1 hit, "Love Machine," in 1976. 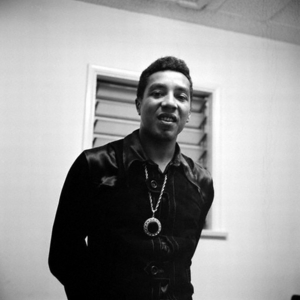 Smokey Robinson began a low-key solo career while concentrating on his duties as vice-president of Motown, releasing his first solo LP, Smokey, in 1973. His first hit single, "Sweet Harmony" (1973), was dedicated to The Miracles. In 1975, Robinson's solo career went into full-drive after the success of the #1 R&B hit "Baby That's Backatcha." Robinson's 1976 single "Quiet Storm" and its accompanying album typified a smooth, slow style of R&B that is today called "quiet storm." Other Robinson solo hits include "Cruisin'" (1979), "Being With You" (a UK #1 hit) (1981), "Tell Me Tomorrow" (1982), and "Ebony Eyes," a duet with labelmate Rick James (1983). He also recorded the soundtrack to the film Big Time (1977). Smokey Robinson is the spokesman of the Great American Smokeout, which takes place annually one week before Thanksgiving. It's a day when smokers quit smoking for at least a day. In 2006, It takes place on November 16th. During the mid-1980s, Robinson fell victim to cocaine addiction. His recording slowed, and his marriage to Claudette faltered; the two were divorced in 1986. Robinson eventually overcame the addiction and revitalized his career, scoring hits in 1987 with "Just To See Her" and "One Heartbeat." Also in 1987, British band ABC scored a US and UK hit with their tribute to Robinson, entitled "When Smokey Sings". In 1988, Robinson published his autobiography, Smokey, and was inducted into the Rock and Roll Hall of Fame. Upon Motown's sale to MCA in 1988, Robinson resigned from his position as vice-president. After one last album for Motown, Love, Smokey (1990), Robinson departed the company. He released one record for SBK Records, Double Good Everything (1991), the same year he won a Soul Train Music Award for Career Achievement. Eight years later, he returned to Motown, which by then was a subsidiary of Universal Music Group, and released Intimate (1999). Since then, Robinson has continued to periodically perform and tour. In 2003, Robinson served as a guest judge for American Idol during "Billy Joel Week." He issued a gospel LP, Food for the Spirit in 2004. A new album of pop standards from the early 20th century, Timeless Love, was released in June 2006. It was originally recorded with a jazz combo, but strings were added after the fact, giving the album more of a lush sound but removing much of the jazz feeling of the disc. In 2004, Robinson's company, SFGL Foods, launched a special brand of gumbo called "Smokey Robinson's 'The Soul is in the Bowl' Gumbo." . In May 2006, at its 138th Commencement Convocation, Howard University conferred on Robinson the degree of Doctor of Music, honoris causa. Smokey Robinson is scheduled to appear on Duets on Fox along with Randy Travis, Patti Labelle, Chaka Khan, Dionne Warwick, Aaron Neville, Clint Black, Michael Bolton, Kenny Loggins, Brian McKnight, Macy Gray, Richard Marx, and Cyndi Lauper. David Foster will be a judge. On 27th October 2006 Smokey appeared on Friday Night with Jonathan Ross.